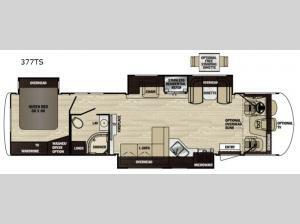 Come see just how easy it is to load up your family and head out on a road trip with this Georgetown XL Class A gas motorhome. Once you reach your destination, you can enjoy the spacious interior of this unit. There are three slides which make it super easy to move throughout this motorhome. You will enjoy sleeping space for five people with a rear queen-size bed, booth dinette, and an L-shaped sofa. In the evening you can enjoy visiting with your family or friends on the sofa while watching the 50" LED TV or enjoying a fire in the fireplace. Get ready to set out to new adventures with a Georgetown XL Class A gas motorhome by Forest River that has been built upon a Ford F-53 chassis. You won't be lacking for storage space with the Rotocast one-piece storage compartments and all of the interior overhead cabinets. In the evening, plan to sit and visit with your family and friends underneath the electric awning, and the LED light strip allows you to visit even after the sun has set. Inside there is a Pioneer dash entertainment system with AM/FM/DVD/Bluetooth/USB and 90 sheen high-gloss solid wood Amish cabinetry. When you choose to camp and travel with a Georgetown XL, you won't be disappointed!